One of the oldest examples of tilapia farming is a bas-relief found in a 4,000 year old Egyptian tomb depicting tilapias held in ponds. The Nile tilapia was called ?n.t by the Ancient Egyptians the fish was of such great importance to them that it was given its own hieroglyph. The hieroglyph is now number K1 on Gardiner’s Sign List, a list of common Egyptian hieroglyphs compiled by British Egyptologist Sir Alan Gardiner. When used as a logogram, this hieroglyph represented a Nile tilapia. When used as a determinative (ideogram), it could signify not only Nile tilapia, but flathead mullets as well. Just like the Nile tilapias, flathead mullets were important food fishes in Ancient Egypt. Tilapia is a large genus in the cichlid family (Cichlidae). It used to be even larger, but quite a few species have now been moved from Tilapia to other genera in the cichlid family, primarily the genera Oreochromis and Sarotherodon. For historical reasons, these moved species are still commonly referred to as tilapia fish in everyday speech. The genus Tilapia, as well as closely related genera like Oreochromis and Sarotherodon, belongs to the tribe Tilapiini in the subfamily Pseudocrenilabrinae. Tilapia is a popular food fish and many species can easily be cultivated in ponds. It has been an important source of protein Africa and the Levant for thousands of years and the Ancient Egyptians cultivated tilapia in ponds along the Nile. The traditional way of farming tilapia is in ponds where the fish can make use of naturally occurring food. In many parts of the world, farm animals such as chicken and pigs are raised in conjunction with the fish ponds since their manure can be used to make the pond richer in tilapia food. During the 20th century, two new methods for farming tilapia developed: tank farming and cage farming. All three types of farming come with their own pros and cons which you can read more about on this site. Tilapia has been raised as food for human consumption for a long time; tilapia farming is believed to have originated some 2,500 years ago. Tilapias have also been transplanted to many countries outside their native range and are now farmed worldwide. In the United States, commercial culture of tilapia is concentrated in Arizona, California, and Florida. It is not clear, however, what species of tilapia are under cultivation. A collection of hybrid stocks currently constitute the bulk of the commercial production. The hybrids under cultivation are female mouth-brooders and believed to have originated from genetic crosses of predominantly blue tilapia (O. aureus) and ancillary O. niloticus, O. mossambicus, and O. hornorum species. Two popular hybrids are the Florida red, a species cross between O. aureus and O. mossambicus, and the hybrid between the O. aureus and O. niloticus tilapias. The aurea strain is principally used because of its tolerance to cold water temperatures. 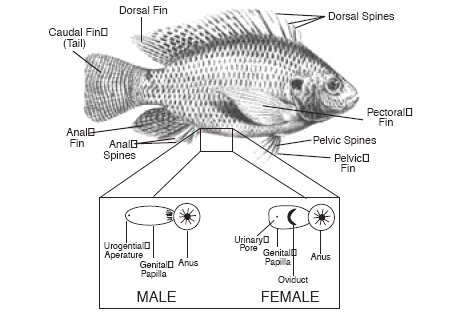 Tilapia are known for their ability to sexually mature at a small size, around 8-10 cm (3-4 in.) in body length, and a young age (sometimes when 2-3 months old). Adult fish are known to live six to eight years, but some fish eleven to twelve years of age have been reported. In temperate regions, the spawning season of tilapia usually begins during the spring months when water temperatures rise, and spawning continues throughout the year as long as water temperatures are above 22°C (72°F). Depending on age, body size, and mode of egg incubation, female tilapia has a large variation in the number of eggs they produced. Blue female tilapia are reported to lay around 9-10 eggs per gram of body weight (around 4,500 eggs/pound). The eggs of hybrid tilapia are yellow-brown in color; egg shaped, and will sink to the bottom when spawned. The eggs vary in size from an average of 2 to 4 mm (0.08-0.16 in.) in diameter, depending on the species and number of spawns. After fertilization, eggs hatch in 2 to 4 days, depending on water temperature. Newly-hatched embryos absorb their yolks in 3 to 4 days. The free-swimming young are then protected by their parents for several days. In mouth-brooding tilapias, incubation, hatching, and care of the young may last a period of about three weeks. After yolk absorption, young tilapias actively feed on a varied diet, such as plankton and detritus.